I thought that a behind the scenes photo of our new collection photoshoot would give a taster of what's to come. 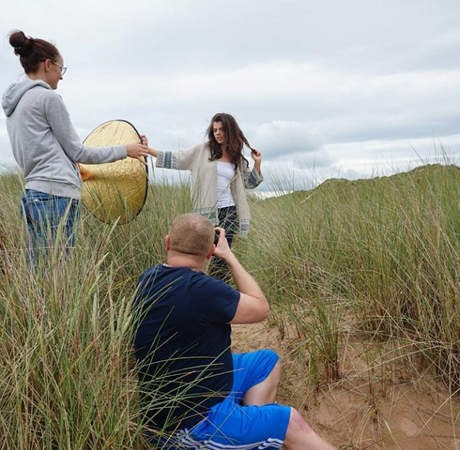 Despite the monsoon-like rain that we have been having here in the North East of Scotland for the last few weeks, we managed to get out to the beautiful dunes of Balmedie beach for our Autumn-Winter 2016 photoshoot. It was great to see our new designs coming to life on models Amy and Callum who did a fab job through shine and rain! I'm looking forward to showing you the final results in a few weeks time when we launch the new collection. With thanks to John for his photography skills and to Laura who produced a natural make-up look for Amy and also took this image.